Are the president's policies helping or hurting? Since taking office two years ago, President Bush has sought to reverse an array of regulations and longstanding environmental-protection laws. Administration officials say many of the old rules actually were harming the environment and the economy — such as by permitting delays in removing flammable deadwood from forests or by barring oil and gas production on public land. 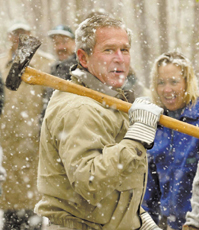 Bush also repudiated the Kyoto Protocol, an international treaty to slow global warming. Conservationists say such actions jeopardize the progress made in restoring environmental health since the passage of bedrock environmental-protection laws more than 30 years ago. They also contend the president's policies favor the energy industry and others that have long chafed at environmental regulations.